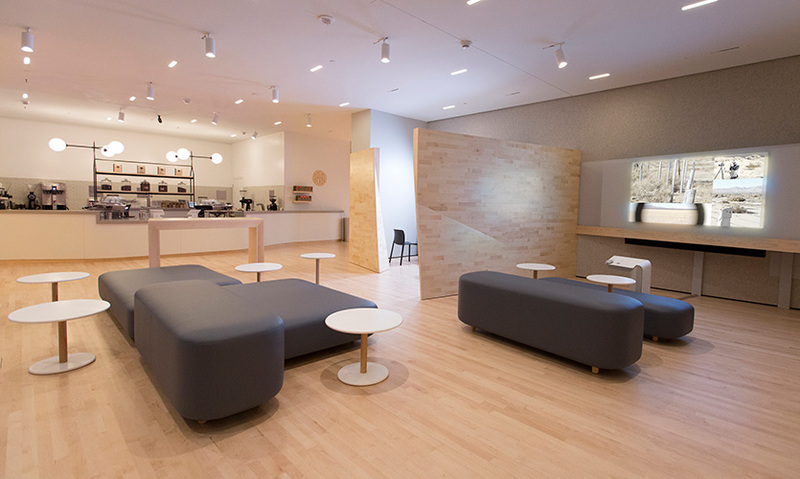 In the thoroughfare between its main photo galleries and a new coffee shop, the team at SFMOMA envisioned a new kind of gallery. The experiences invite visitors to rethink what they know about photography and to look more closely at culturally significant pieces and processes to better understand their impact on the medium and on our world. 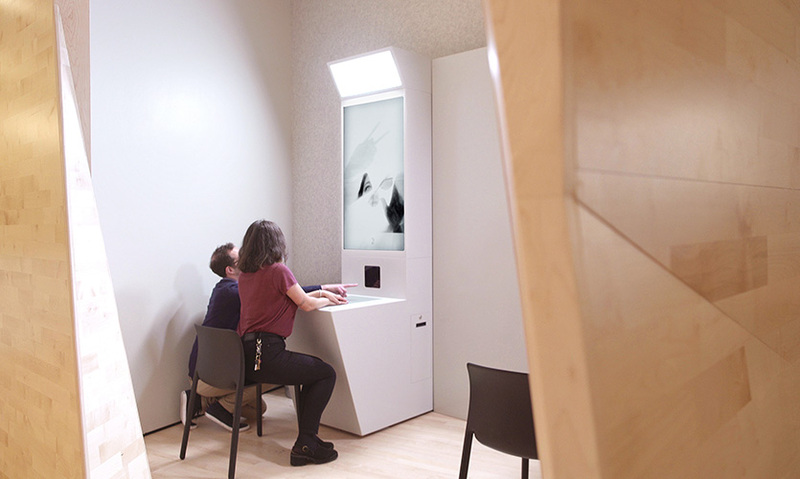 Interactive installations with imaginative interfaces are driven by camera-inspired controls, reminding museumgoers that they are more than mere bystanders in an era where many of us have powerful cameras in our pockets. 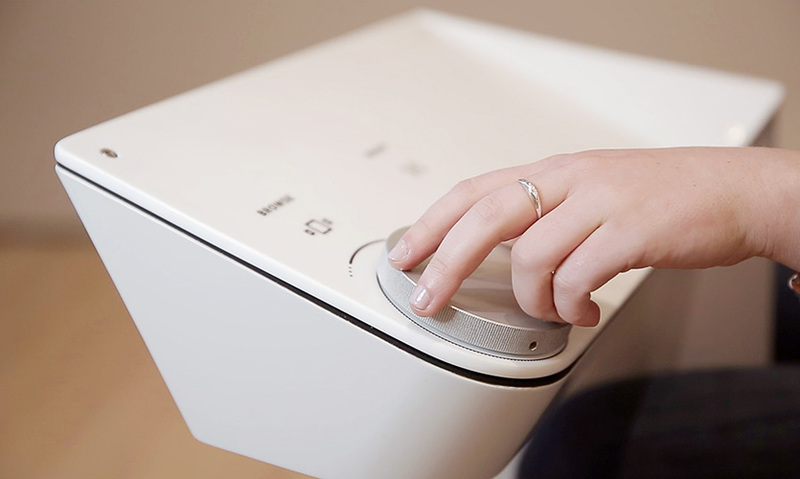 Analog dials inspired by classic camera controls offer visitors a tactile interaction point. 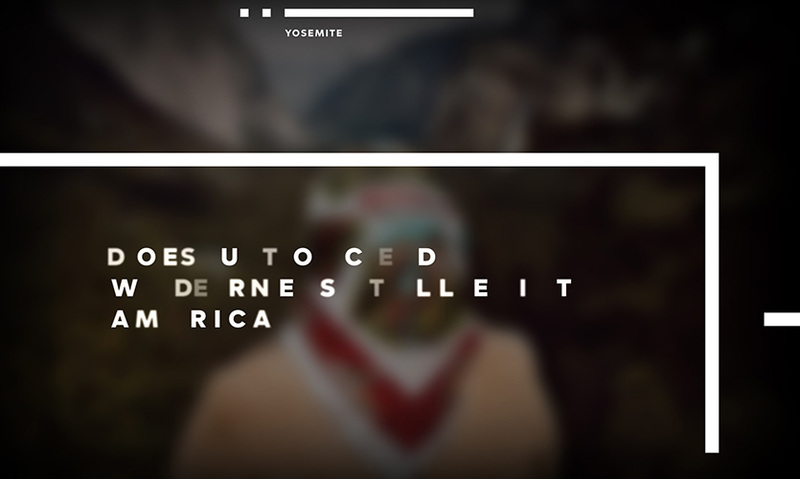 Imaginative interfaces pique visitor curiosity. SF MoMA's photographs are the star of the "The View from Here" interface. “Photography is one of the foundations on which this house is built. We want to set it up as the equal of painting here,” said SFMOMA Director Neal Benezra. SFMOMA has been photography’s longtime champion, and with the addition of its massive Pritzker Center, it is now home to the largest space permanently dedicated to photography in any art museum in the United States. As part of its massive three-year renovation, SFMOMA wanted to do more than just display its works—it wanted to contextualize them and bring them to life to give visitors fresh perspective on the photographs we see and take every day. The museum designated the 1,500-square-foot area between the main photo galleries and the new Sightglass coffee bar as the ideal space for an array of interpretive media. But, it was also the perfect place for visitors to relax, grab a snack, and take a break from browsing the collection. SFMOMA expected some visitors to be hungry for more insight into its photographs, but it also expected others to be just, well, hungry. It was the Second Story design team’s job to not only design and develop a suite of interactives but also to build out the transitional space to cater to lounging, coffee-drinking, croissant-nibbling, socializing and gathering, all in equal measure. It was a tall order (pun intended), but the Second Story team rose to the challenge of the Photography Interpretive Gallery. As an interpretive space, the gallery fires on all cylinders. 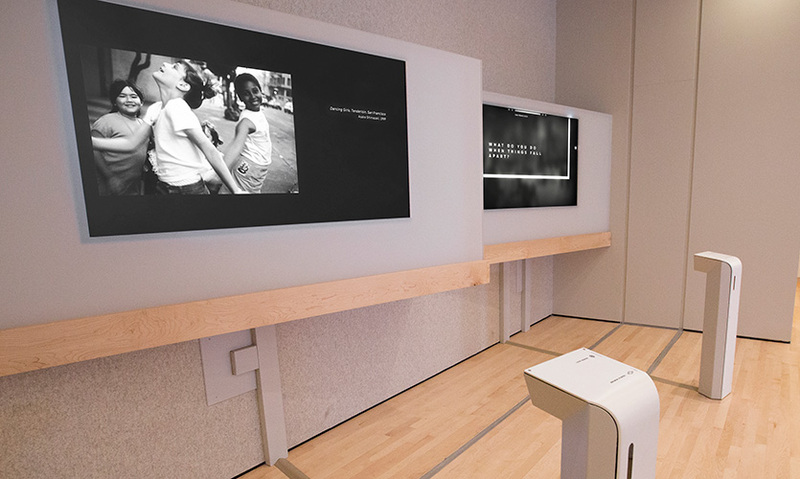 Interactive installations with imaginative interfaces are driven by camera-inspired controls, reminding museumgoers that they are more than mere bystanders in an era where many of us have powerful cameras in our pockets. The experiences invite visitors to rethink what they know about photography and to look more closely at culturally significant pieces and processes to better understand their impact on the medium and on our world. 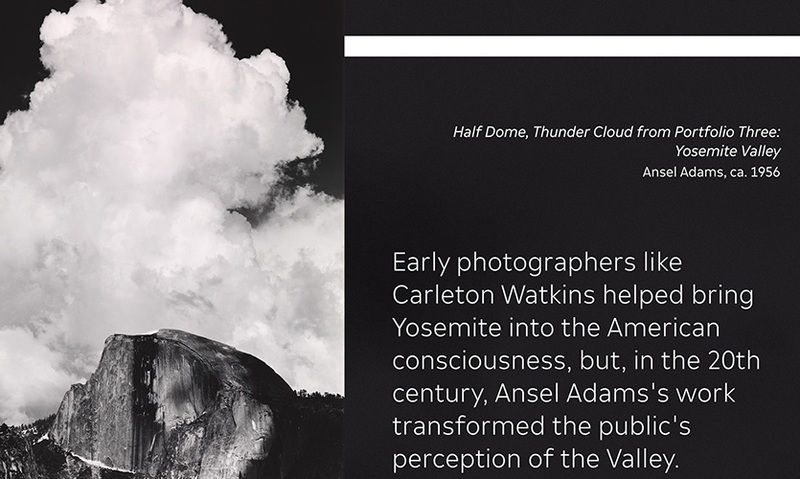 Visitors learn, for example, about photography’s influence on the creation of Yosemite National Park. They can watch Liz Deschenes describe the laborious process of producing her camera-less photograms and reconsider their own roles as photo creators by constructing a surprising selfie using the contents of their pockets. Those searching for more perspective on the meaning of photography find it in the space. Those looking to the gallery for a moment of respite also find it. The design team arranged seating into centralized islands for socializing and lounging and produced minimal digital interfaces that are compelling up close, interesting from afar and unobtrusive in the periphery. The Second Story team selected materials for the interactive consoles that would hold up to coffee spills and croissant crumbs. Cleanly designed to complement to Snøhetta’s stunning architecture, the warm and inviting space lets visitors flow through, socialize, relax and enjoy their lattes comfortably. "The beauty is in the details here: the subtle lines of an interactive kiosk, the tactile knob to browse images, the super-restrained typography. This space provides a place for contemplation, where the photographs can assert their presence without shouting." "'The clubhouse of the museum' was created by members of a collaborative industrial design, media and graphics team to have visitors join in. 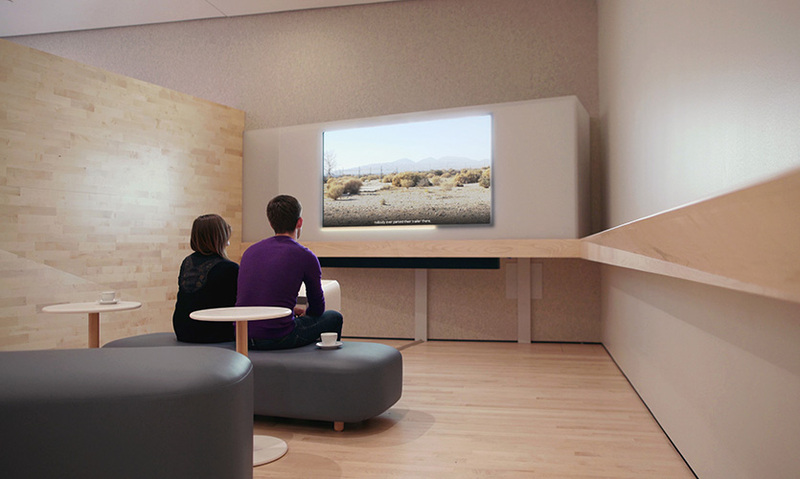 Black and white interactive media stations and screens reside amongst comfortable chairs fostering dialogue about SFMoMA’s fine photography collection."